Express approval, Express money. With basic company documentation, our professional SME Loan consultant team will contact you to analyze your problems and tailor a loan proposal that best suits your needs. Our loans never affect your TransUnion credit rating. In addition, new customers can enjoy an extra interest rate discount. Mr. Lee, a Hong Kong resident owning a tech company, operates an electronic payment platform in Mainland China. With the good prospects of the technology industry in Hong Kong, Mr. Lee intends to expand his business there and the cost of investing the development platform is estimated over HK$1 million. Since his business and income stream are all based on Mainland China, Mr. Lee had reached a deadlock in applying for bank loans. With the help of Asia One, via referral, Mr. Lee has been granted a loan in the amount he needed just two weeks after our easy and simple application procedure. We have also devised a flexible repayment terms based on the industry features, thus Mr. Lee can finally focus on developing his own business. Regardless of the industry and scale, once we receive your invoice and basic company documentation, Asia One's professional consultant team will promptly contact you and present flexible repayment terms for your decision. It only takes as soon as seven business days from complete application to release your loan payment. Neither penalty nor handling fees will be charged for early repayment of your loan. Application and cost control could never be easier. Mr. Cheung, the owner of a trading company, plans to expand his business scale. In order to facilitate a greater volume of orders, Mr. Cheung needs a sufficient cash flow to repay his suppliers. After two months of haggling with traditional banks, he can only obtain some short-term loans and overdraft line which cannot satisfy even half of his cash requirements. The lengthy and tedious application procedure has affected his working schedule and deprives Mr. Cheung of the time to explore other business opportunities. Not to mention, the bank loan deteriorates his personal credit rating, which also pushes his financing costs up in the long run. With the help of Asia One, Mr. Cheung has finally obtained the exact amount of cash he needs based on each invoice. 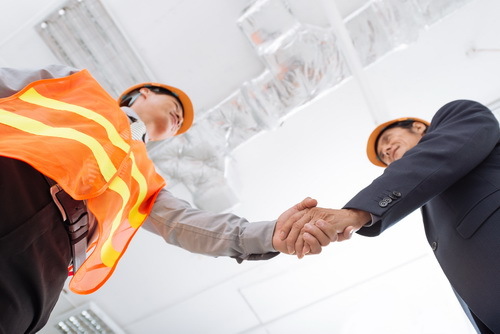 Through our express loan approval and amount withdrawal, Asia One helps subcontractors to flexibly manage their financing, relieve cash flow pressure, free up capital for different projects, and finally maximise company profits. Mr. Lui, a subcontracting business owner, recently received a new project of HK$30 million, for which the initial operation requires substantial cash flow. However, due to the fact that the company recently started several projects that require a large amount of cash as well, Mr. Lui applied for a loan from Asia One to address the need of sufficient cash flow. After meeting with our professionals, a total amount of a HK$2 million loan has been provided for him at a monthly interest rate of 0.83% and a loan tenor of nine months. In order to further satisfy Mr. Lui's desire of reducing the total interest expense, the loan only requires him to repay the interest for the first three months and both the interest and principal for the next six months. To lend and repay at ease! Asia One has provided loans totaling HKD300,000 (at an annual interest rate of 9%) to subcontractor A. After that, A purchased materials valued at HKD100,000 from Mattex (Construction Material e-Procurement Platform), a fellow subsidiary of Asia One. Upon providing those invoices, we then pay on behalf of A on the payment date. Interest is calculated from the date of payment, of which the monthly interest expense is HK$750 while the daily interest is only HK$25.